View More In Multifunction Tools. Have You Ever Had The Need To Adjust Your Seat Or Your Bicycle Handlebar While Out On A Ride? We believe that going out on a ride is a great exercise and a great feeling of freedom that should not be ruin because you are not carry a good bike tool kit to use when you really have the need for it, that is why you should be prepared with the high performance DOKO-IN bike tool repair kit. 4 good reasons why to buy the DOKO-IN bicycle tools kit! All You Need For Your Bike Maintenance - We Believe In Simplicity With Good Performance That Is Why We Designed Our Tool Kit To Be Handy With Only 14 Tools That You Really Need For Your Bike! Not like Others That Gives 18 and Even 28 Tools That Most of them you don’t Really Need With Such A Small Tool Kit. We Provide 6 Allen Hex Keys, 2 Screwdrivers, 2 Spoke Wrench Keys, a Tire Levers And A Chain Rivet And We Know By Experts That This Is Enough For ON-THE-GO Maintenance. High Quality Material That Last for Long - Our DOKO-IN Bicycle Tools Kit Is Made Out Of CRV Hardened Steel Corrosion Resistant Metal That Usually Used With Professional Tools And That’s Why Our Tool Kit Is Strong, Sturdy And Can Last For Long Time. 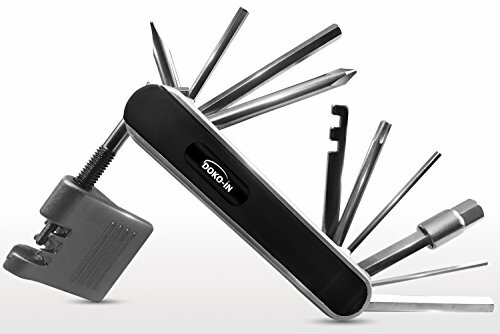 Convenience - The DOKO-IN Bike Tool Repair Kit Is So Easy To Carry Around With Weight Of 6.3 Ounces and size of 8.8*4.2*1.6cm You Will Have No Issues To Use It Anytime You Need It and carry it even with your pocket. All Around Multi-Tool: Our Bike Multi-Tool Is Also Great For Any Other Task That You Have That Require One Of The Tools In It , Can Use For In-House Needs Or Other Staff You Need To Connect Or Adjust, With This Tool In Your Pocket You Can Find Many Uses On Your Daily Life Routine. Click the "Add to cart" yellow button at the TOP RIGHT and start cycling with confidence right away! ALL YOU NEED FOR ON THE GO REPAIR OR ADJUSTMENTS FOR YOUR BIKE - 14/1 Multi-Function Tool Repair Kit With PH1 Phillips Screwdriver, Box Spanner T25, Phillips Screwdriver, Flathead Screwdriver, Allen Wrench/Hex Key: 2mm/2.5mm/3mm/5mm/6mm/8mm, Spoke Wrench key 14/15 GE, Tire lever and Chain Rivet. All Function With Easy Way Of Operation And With Strong Metal To Support The Pressure. COMPACT AND LIGHT WEIGHT - The DOKO-IN Bike Tool Repair Kit Is So Easy To Carry Around And Keep With Your Saddle Bag Or Even in Your Pocket With Weight Of 6.3 Ounces and size of 8.8*4.2*1.6cm You Will Have No Issues To Use It Anytime You Need It. SUCH A SMALL TOOL WITH SUCH A GREAT BENEFIT - Our Bike Multi-Tool Is Also Great For Adjusting The Bike Attachments, Anything From Bike Carriers Or Bike Racks, Lights And Bottle Holders and even Baby Carriers. With The DOKO-IN Multi Tool Kit, You Are Ready For Almost Anything That Goes Along With Your Bike. STURDY AND BUILT TO LAST NO MORE BREAKING OR BENT TOOLS - Our DOKO-IN Bicycle Tools Kit Is Made Out Of CRV Hardened Steel Corrosion Resistant Metal That Usually Used With Professional Tools And That's Why Our Tool Kit Is Strong, Sturdy And Can Last For Long Time. ORDER YOUR NEW BIKE TOOL KIT NOW WITH NO HESITATION - we in DOKO-IN team believe that servicing our customers is our main goal as we know that the only way we can grow together is by having our customers satisfied with the products we provide. That's why we have strong confidence with our products and we take full responsibility in case that anything goes wrong. If you have any questions about this product by DOKO-IN, contact us by completing and submitting the form below. If you are looking for a specif part number, please include it with your message.